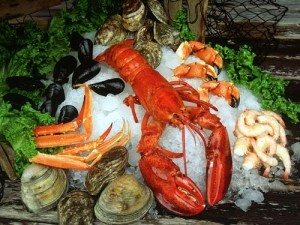 The average American consumes about 15 pounds of seafood each year. How do consumers choose which seafood to buy? Do seafood labels affect buyers? Does information about sustainability make a difference in grocery store purchases? Fishermen, seafood retailers, and policy makers, consumers, and others are all impacted by the answers. Economists sought to answer just these sorts of questions in a paper called “Measuring willingness to pay for environmental attributes in seafood,” published in the journal Environmental and Resource Economics earlier this year. “Consumers are willing to pay a premium for seafood labeled as sustainable,” said the study’s lead author, James Hilger, PhD, NOAA Fisheries Southwest Fisheries Science Center. The researchers capitalized on the roll out of a new seafood label administered by FishWise in a high-end grocery store chain in the Bay Area. They introduced a “traffic-light” seafood label to its stores a few at a time. The label used green, yellow, or red to denote “best choice,” “proceed with caution,” and “worst choice,” respectively. In addition, each product was labeled with the species, catch method, country of origin, and the price. The results indicated that the labels affected buying choices and that shoppers preferred products labeled as more sustainable choices. The researchers also found that consumers preferred specific sustainable product attributes: wild-caught over farmed, selective over less-selective fishing gear, U.S.-caught over imported. Funding for the study was provided by California Sea Grant College Program.